Shape memory alloys are active materials that respond to a temperature change with a shape change. A structural transformation from a low symmetry/low temperature phase (martensite) to a high symmetry/high temperature phase (austenite) governs the shape change. A shape memory alloy can be trained to have specific, and different, shapes in both the austenite and martensite phases. The material can then be mechanically stressed and deformed, achieving strains of over 6% through a shear-deformation mechanism known as twinning. The original shape of the material can be recovered by heating the deformed martensite back into austenite. If the austenite phase occurs above the operating temperature, the material exhibits a property called superleasticity. At a critical load, the material acts as a constant-force spring over a strain of 5 – 10%. Ni-Ti, commonly referred to as Nitinol, is the most common shape memory alloy and has been used in a variety of technologies ranging from medical stents to high-stroke linear actuators. The material must have a low twinning stress so that twin boundaries are mobile. The material must be ferromagnetic with a high magnetic anisotropy when compared to the energy necessary to move twin boundaries. Multiple twin variants, separated by a twin boundary, can exist within martensitic Ni-Mn-Ga . When sufficient magnetic-field-induced stress is applied to this material, the twin variant that is preferentially aligned to the magnetic field grows at the expense of other twin variants. This change in the crystallographic orientation of the material is caused by a shear deformation process called twinning. Large, reversible strains of of 6 – 12% can be controlled by an applied magnetic field. Induced strain is stable even when the energy source is removed. Full actuation of a sample can occur in less than 1 ms.
Low twinning stress materials can convert energy from the applied magnetic field with an efficiency as high as 90%. The MSM micropump utilizes a heterogenous magnetic field from a diametrically magnetized permanent magnet to locally strain the material nearest to the poles of the magnet. 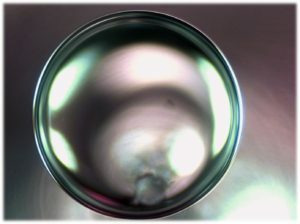 The resulting small cavity follows the poles of the magnet when the magnet is rotated. 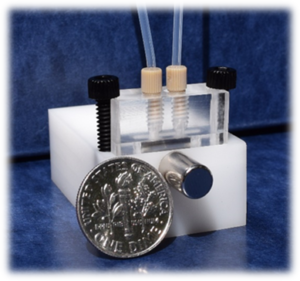 The MSM micropump captures this motion by placing the material within a microfluidic channel. Fluid from the inlet side of the channel is peristically transported to the outlet using the MSM effect. Further details about how magnetic shape memory technology can be found at The MSM Net.